The aviation landscape is changing. The utility of the “eye in the sky,” once accessible only to governments and wealthy individuals, is now available to people and businesses of every size through drone technology. From aerial surveys, to agricultural monitoring, to law enforcement, to search and rescue, to real estate, to Amazon Prime Air—the potential uses and users of drones is endless. With the exponential increase in drone traffic, the question must be asked: How are we going to keep drones apart from manned aircraft? Drone safety is quickly becoming one of the most important aviation topics today. AirNavigation Pro and senseFly have joined forces to create an exciting, innovative aviation safety solution that radically transforms the way drone operators and manned aircraft interact. The Safer Together initiative will provide senseFly drone operators and Air Navigation Pro pilots with a graphical display of each other’s operations, giving them the information they need to avoid a collision. This initiative is a game changer in the industry; Air Navigation Pro is the first application to offer this radical new drone safety and situational awareness tool. 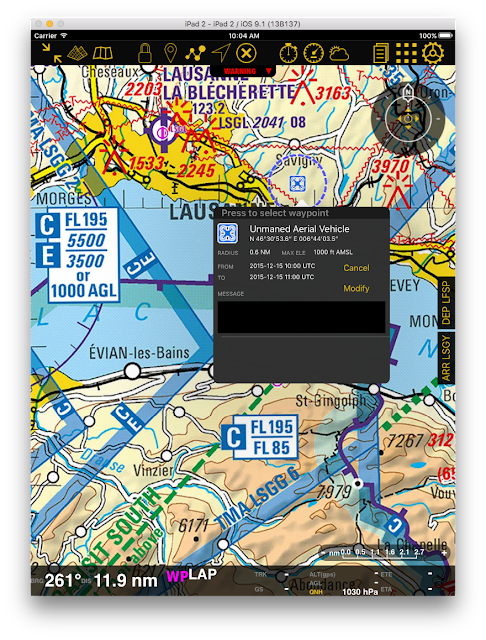 Drone operators using Air Navigation Pro and registered drone operators can upload their flight plan information (called an advisory activity) to the Air Navigation Pro servers. 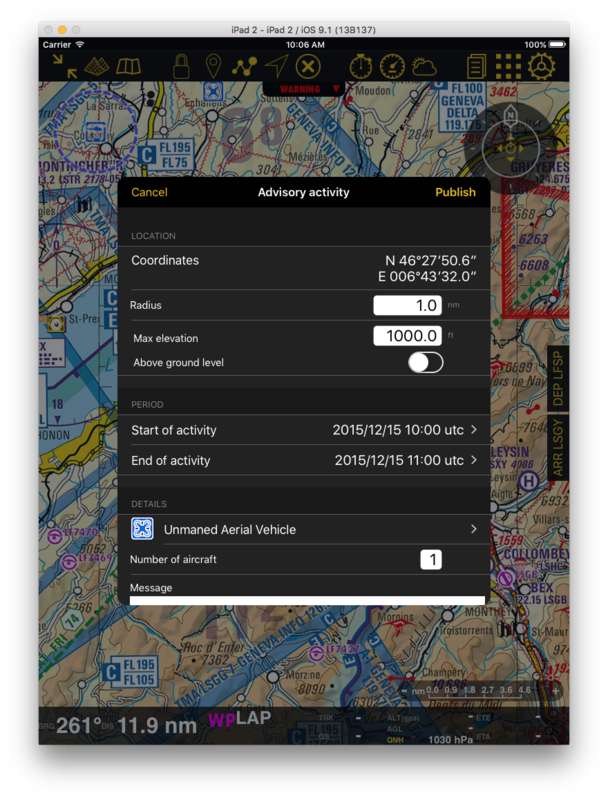 Air Navigation Pro pushes this notification out to all of the iOS users of its flight navigation platform, allowing each user to have an awareness of the drone’s presence in the area. 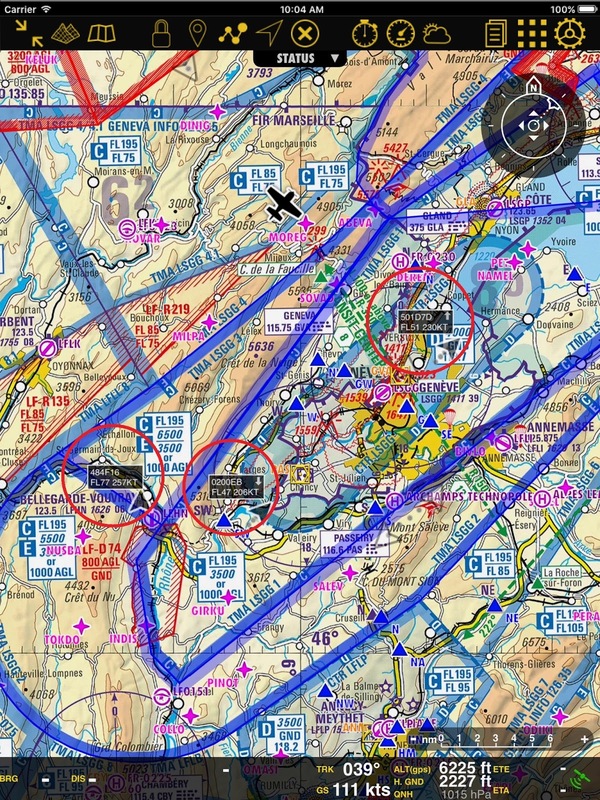 The drones’ operational areas are depicted in graphical form on the Air Navigation Pro moving map, using both a drone symbol and a dotted blue circle corresponding to the area that the drone will be flying in. Tapping on the drone symbol reveals vital information about the unmanned aerial vehicle, including its operating radius, maximum altitude and times of operation. This one-of-a-kind drone safety service offers general aviation pilots NOTAM like information regarding potential conflicts with drone operators in an intuitive graphical format. For example, here is an unmanned aerial vehicle operation area east of Lausanne: By zooming in on the map display, the operating radius of the drone can be seen as a dashed blue circle. To get more information about the drone operation, tap the blue drone symbol. 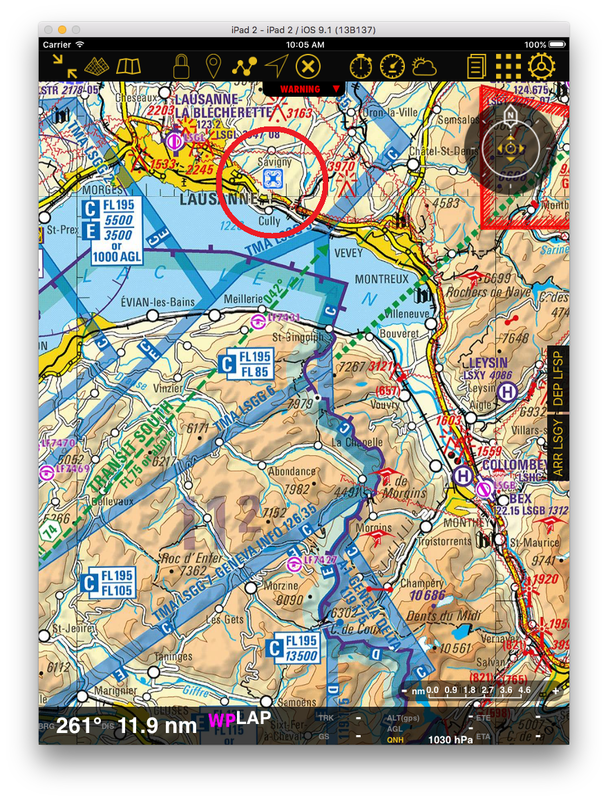 All of this information is available to Air Navigation Pro iOS users. This is a FREE drone safety enhancement. Each company operating a drone must register at http://uav.airnavigation.aero. Each drone pilot must be registered at http://myuav.airnavigation.aero/signup/. Select Register Vendor on the top right hand side of the screen. Complete the registration form. Be sure to select the Advisory Activities and Push Position boxes. Tutorials are provided to help you get started. 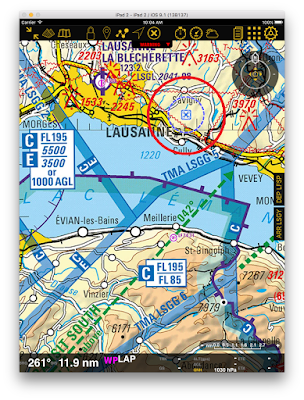 As important as it is for General Aviation pilots to be aware of potential drone activity in the area, it is equally important for drone operators to be aware of aircrafts nearby. This two-way communication is the key to the Safer Together concept. Drone operators can view the position of flights planned using Air Navigation Pro, giving them time to change the drone's course, altitude or abort the flight to ensure not just drone safety, but the safety of other airspace users as well. By using Air Navigation Pro’s API integrated into your drone management software, live position tracking is available using our navigation app. This will enable the drone’s position to be transmitted every two seconds to your Air Navigation Pro equipped iOS device. Since the drones position is being transmitted through Air Navigation Pro, other aircraft in the area will also be able to view the drone’s position, enhancing situational awareness and permitting collision avoidance at the earliest possible opportunity. This cutting edge drone safety feature is available only with Air Navigation Pro! On the Air Navigation Pro map display, drones and aircrafts will appear as black arrowheads. 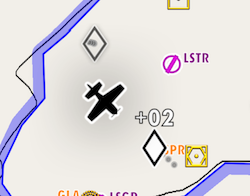 As an aircraft using Air Navigation Pro approaches a drone the symbol changes to yellow to indicate a potential conflict. In this case, the drone is 400 feet below the aircraft and climbing. 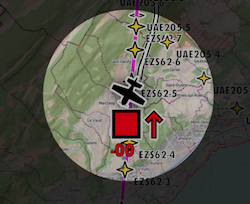 If the aircraft continues to fly closer to the drone, the symbol changes to an upgraded warning. Gradually from white, yellow to red. Air Navigation Pro’s initiative offers a first of its kind solution to the most vexing drone safety issue that operators face: the danger of collision with manned aircraft. Through innovative and cost effective technology, the Safer Together initiative has increased the awareness level of both pilots and drone operators, providing the most effective mitigation to date of this very real threat. As the numbers of drones aloft continue to increase, be sure to look to Air Navigation Pro to meet all your navigation and monitoring needs, whether you are in the air or on the ground. If your company is interested in using this important drone tracking feature, reach out to Xample through our contact link http://airnavigation.aero/contact-us/. We’ll be happy to evaluate your requirements and to build you the safety system that you need.